On beach living at off beach price! Dog friendly. 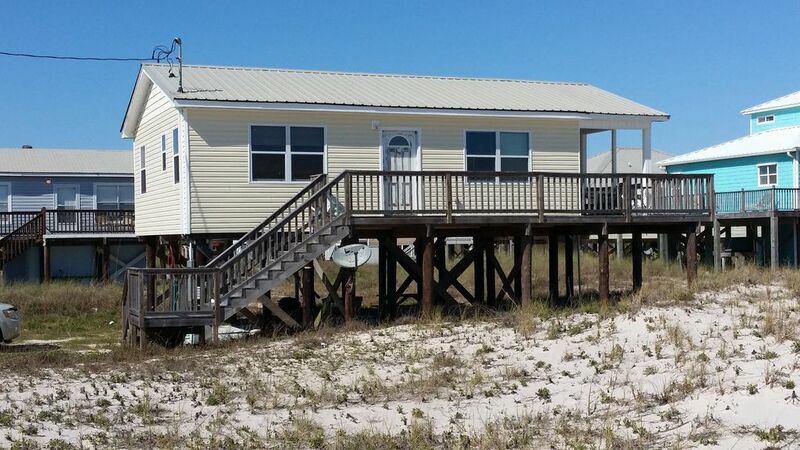 Paw Paw's place is an old style beach house just steps from the sugar white gulf sands of Ft Morgan. You will have everything you need to make your beach vacation perfect. With two bedrooms and two baths it sleeps four guests. While the rooms are small, the living is big! The wrap around porch offers a great gulf view; only one house sits between Paw Paw's Place and the rolling surf but it does not obstruct your view. If you want to take a swim you've only 120 ft to walk to be right on the beach. A full laundry is located in the new master bath so you can keep up with all the beach towels and wet swim suits. All of your linens for the kitchen, beds, and baths are furnished; just bring your favorite beach towels and swim suit. The kitchen is fully equipped and well stocked if you are eating in. If you want to grab dinner out Tacky Jack's 2 is less than a quarter mile away and Sassy Bass restaurant, store and pizza is only about a four mile drive. If you are in for the evening have fun playing games or watching cable TV in the comfortable living room. There you will find a full size sofa, chair and Paw Paw's favorite recliner. Cook hot dags and hamburgers for everyone on the park style charcoal grill down stair and dine on the picnic table under the house. Paw Paw's in very close to several great day excursions. Historic Ft Morgan is about a mile west. Enjoy exploring the Fort and its museum. You can also catch a ferry there that will take you over to Dauphin Island where you will find Ft Morgan's sister Ft Gaines. Kids will love the Estuarium, a hands on marine life kids museum. If you travel east about 10 miles take a walk on the Pine Beach Trail in the Bon Secour National Wildlife Preserve or visit Gator Lake. You can launch a kayak in Little Lagoon about three more miles east of there. If you can pull yourself away from the porch. go on up into Gulf Shores proper, a 20 mile drive; you will find tons of eateries, shops, a water park and many other beach attractions. Only 120 feet to the beach!! Awesome view. Good bang for your buck... very clean cottage, just a few steps from the beach. We enjoyed our stay as did our Fido. Short distance to Tacky Jack’s for food and drink. Thanks Chris, so glad you enjoyed your stay. Thanks for leaving the house in great condition! Hope you will be back! Overpriced for what you get. Kitchen faucet leaked, bathtub would not drain, both items fixed while we were there. These should’ve been identified by the cleaning staff prior to arrival. Additionally, toilet in second bathroom would not always clear the bowl when flushed, handle on shower door held on by a wire and a loose bolt, Coffee pot had to be washed before could be used, coffee warmer was covered with crud, oven was filthy it didn’t look like it is ever been cleaned, living room rug had a great deal of sand in it, storage for food was for all practical purposes nonexistent, there was a bucket under the second bathroom sink suggesting that there was probably a leak there. Bottom line unit needs a great deal of work to demand the price that they’re asking. There are other units in the area price a great deal more reasonably. Thank you for your review. We always appreciate feedback from our guests. It helps us know what needs to be done to make your experience better. It also lets us know how housekeepers are doing. If you ever find our cleaning to be inadequate please call us immediately. We will send a housekeeper out ASAP to re-clean the home. Likewise, if anything is broken or missing a quick report will get it handled while you are there. If there is an item you need but can't locate, again, a quick call and we will try and get it for you. The owner is in the process of updating this older cottage. This year he replaced all the ceilings with lovely tongue and groove wood. A new master bath was previously added. The doors have been removed from the tub mentioned and a rod and curtain installed. New sink faucet works beautifully. There is not a leak under the bath sink; the pan stored there is for guests to use should they need it for other purposes. Bottom line, we want to hear from you while you are here so we can help make your experience in our home great! 20th Anniversary trip with our 2 chihuahuas. Great location right at the beach entrance. Cozy cottage. Martha was very nice when we spoke on the phone. We found the place VERY clean and the location excellent. We picked the House because they accepted dogs and it was close to the beach. I tend to agreed with other reviews that it desperately needs updating, and the supply list is true to form. You must bring everything except toilet paper. The grounds could use some upkeep. I would stay here again, as they accept dogs,the place is clean, and the location is excellent. Awesome location for really enjoying the beach! My husband and I recently divorced. Still dear friends, we didn’t want to forego our annual beach trip. We feel like this beach house was a blessing to us! It’s not fancy by any means, however all ones needs are met. The simple interior is beachy and comforting. Only one home obstructs the view to the beach but looking left or right let’s you see the waves clearly. We’ve never had this short of walk to the beach! Didn’t even need flip flops from the house to our spot! Our sincere thanks to the owners for sharing their special place and to Martha for making booking, arrival and check-out so easy. Our trip was healing and sparked good conversation about relationships and life! An added FYI, we opted to purchase all our food and beverages at Rouses on the way in about 19 miles from the home. Though Tacky Jacks is nearby, we anticipated wanting to sip an adult beverage on our own porch without wait times and the predicament of driving. Our menus over three nights were filets, dungeoness crab, and Icelandic cod each paired with great wine and sides. Though the kitchen and cooking utensils are not “contemporary looking” we had all we needed to make this happen. A small charcoal grill near the carport is great! For us, optimizing the time at the house was the best option! I cried when we left! This home is located approximately 20 miles down the Ft Morgan peninsula near the mouth of Mobile Bay. While its address is Gulf Shores it is well away from the big crowds and traffic found up in Gulf Shores proper. Here you can enjoy the local way of life. As a guest you can schedule fishing charters at the marina that is half a mile away, explore the pre-Civil War Fort, ride the ferry to Dauphin Island, and enjoy seafood at Tacky Jack's 2 without going very far.